What is your daily activites in project? What is extent clause in tablespace? Which sitivation are you worked temparery table? What are the datatypes in sql? What are the char datatypes? Diff b/w char & varchar2? What is timestamp returns?default size of timestamp? What is defaults timestamp format like 12 or 24? Do you know any character datatype without char,varchar2? Do you know any number datatype without number & integer? 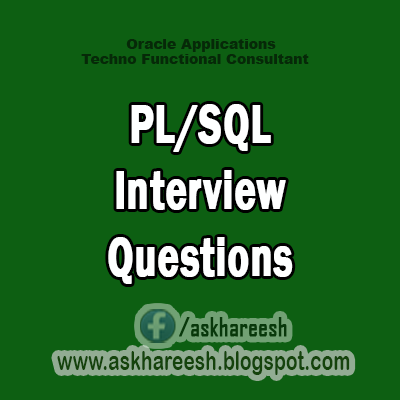 Tell me some pl/sql datatypes? Do you have create table column's with boolean datatype? Why boolean datatype is not possible to create a table column? What is constraint? What are types of constraints? What are the master & detail table? Which will fire first constraint or trigger? Which format are you used build a sql query? What is the use of timestamp in select statements? Which datatype does not allows 'null' values? Diff b/w whare,having & group by clause? Can you drop all columns in a table used alter command? Can you modify a null column to not null column, if table has some data? What are functions there in sql? What are the substr() & instr()? what is the conversion functions? what is diff b/w nvl,nvl2,&nullif()? diff b/w rank() & dense_rank()? what is join? Types of joins?what is outer join? diff b/w exist & in? what is sequence? Can you alter startwith clause? can you create synonym same name of object? diff b/w view and synonym? can you create synonym on procedure,package,functions? what is index? Types of indexes? can you create index on index? what is raise_statement? How to declate it? can you use out parameter in functions? which sitivation you have used utl_file packages? hot to debugg your code? what are the majer step's you are consider in explain? what is collections & types of collections? can you use varchar datatye in indexed_by_table? can you use collection method types in functions?